Learn how to set up your Bluetooth card reader so you can start taking payments with GoPay or QuickBooks Online mobile today. More information about our Bluetooth card readers can be found at QB21 and QB31 Bluetooth card reader features and compatibility. Note: The mobile card reader comes with a USB cord for charging. If you're having a difficulty finding it, pull the tag on the left side of the packaging to reveal a smaller box that contains the cord. Turn on the device by pressing and holding the button on the side until the green light is visible. Select More at the bottom. Select Hardware, then choose Card Readers from the menu. Select the Card Reader type, switch to Bluetooth reader, then go back to the previous screen. Ensure Bluetooth and QB21 device are both turned on. Select Add a new reader. This allows the phone to detect the reader. Select the Bluetooth card reader. 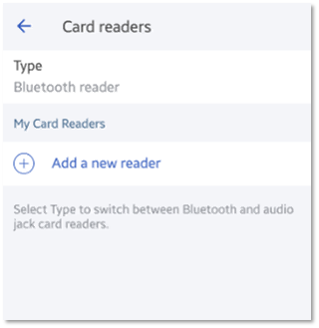 The reader should now be visible under the My Card Readers section. 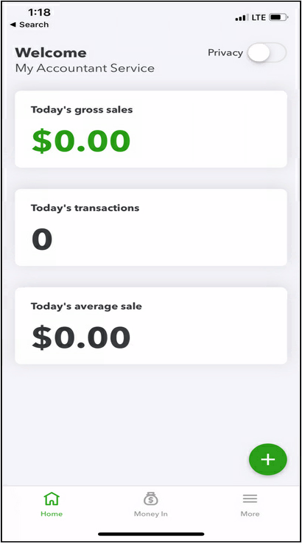 Select Home then +, to go to the New Payment screen. Process a payment using your Bluetooth card reader. Chip: Insert the card into the front slot with the chip facing downward, and the magnetic stripe facing the Payer. Swipe: Slide card across the slot on the back of the reader, and the magnetic stripe facing the Payer. Contact list: Customer will have to tap their device to the front of the reader to use Apple Pay, Google Pay, and Samsung Pay. To turn on the device, press and hold the button on the side until the green light is visible. Tap the Menu in upper-left and select Settings > Card Reader. Select Type, switch to Bluetooth reader and go back to the previous window. Ensure Bluetooth is turned on and QB21 device is on. Select the Chip and Swipe reader. The reader should now be visible under My Card Readers section. Return to New Payment to take a payment. Chip: Insert the card into the front slot with the Chip facing downward, and with magnetic stripe facing the Payer. Swipe: Slide card across the slot on the back of the reader, and with magnetic stripe facing the Payer. NOTE: Front of reader = USB slot positioned on the bottom left-hand corner. Still need help connecting your reader? Here are some steps you can do to help you connect your mobile reader. 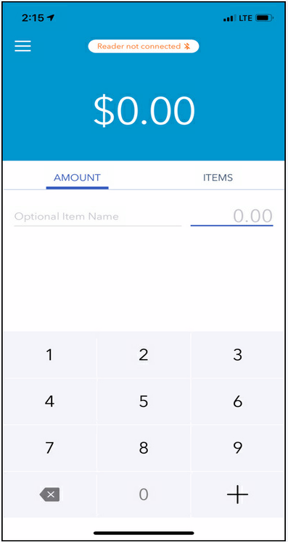 Note: You must be logged into GoPayment or QuickBooks Online mobile app as an administrator to access the Card Reader settings. Solution 1. Disconnect and reconnect the card reader. From the upper left menu, select Settings. Select Card Readers, then choose the card reader you want to disconnect. From the Reader Actions drop-down, select Forget Reader. From the Readers Actions drop-down, select Forget Reader. Solution 2. Make sure Bluetooth on the mobile device is on. 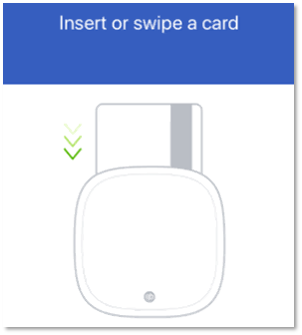 Bluetooth card reader can only be connected to Bluetooth compatible devices. Make sure that your device's Bluetooth is turned on. Solution 3. Turn your mobile card reader on/off. To turn the card reader on, press and hold the power button on the side of the device until the green light is visible. If your card reader comes with a charging dock, remove the device from its dock prior to pressing the power button. Solution 4. Update QuickBooks GoPayment and QuickBooks Online mobile app. Launch your App store, then select Updates. Launch your Play store, then select My apps & games. Solution 5. Download and install (OS) updates. Check the support website of your device’s manufacturer for detailed steps on how to install updates. Select Settings, then About device. Tap Update, then Check for Updates.